The release of this design package had to wait until I could address a serious issue. As visitors to my CGOA Conference fitting labs can tell you, there is so much to be learned from seeing garment samples on different bodies. Last month in Charleston I threw the shrug (Carbonite grey) and jacket (Emerald Deep green) versions of this design on as many victims… uh, volunteers… as walked past the DesigningVashti exhibitor booth and decided there should be a larger, roomier version (Dark Roast brown). Done. DJC: Lotus Curacao Jacket in three versions is now ready for your perusal in the pattern shop at DesigningVashti.com. 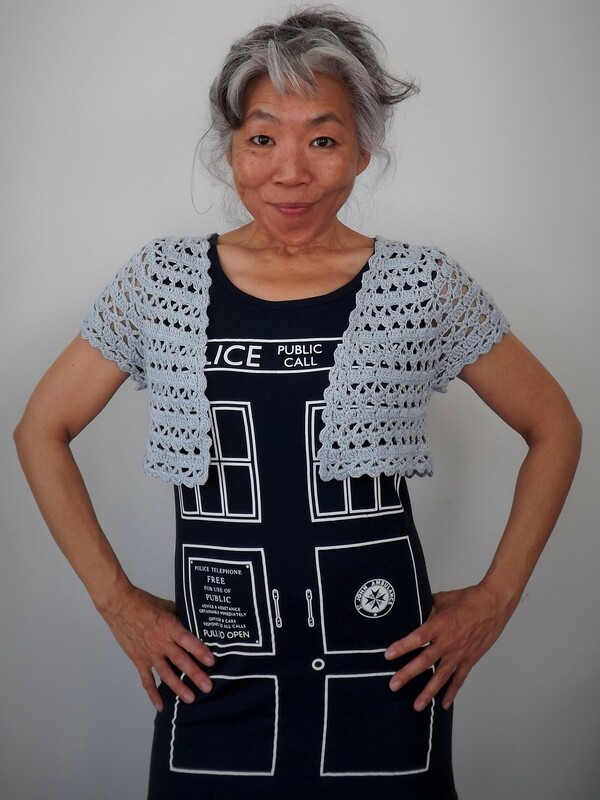 In preparation for that July 2016 conference, in keeping with the event theme of crochet pineapples, I considered my relationship with the stitch (see previous post) and cast my thoughts back to the one pineapple design deserving a reboot. 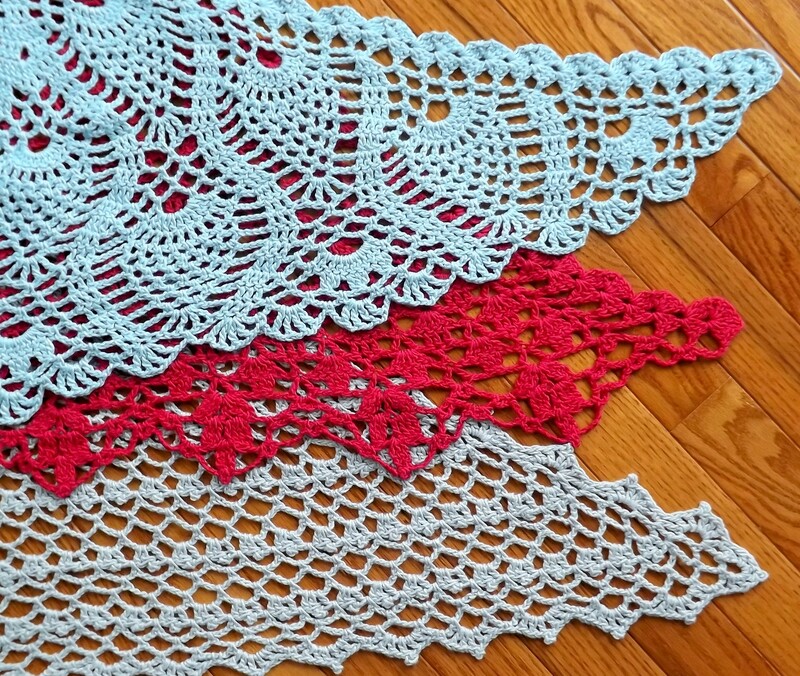 This is the original Blue Curacao Shawl as published in Amazing Crochet Lace (Potter Craft, 2006), my first book now out of reach. See how the winged shape of the shawl drapes over the shoulders in such a way that the sides want to form sleeves? Already resembles a jacket, huh? So why not just do it that way? To create a season-spanning garment, I swapped out the original DK weight fluffy wool blend yarn to now use DesigningVashti Lotus, a sleek, luminous sportweight blend of cotton and rayon. 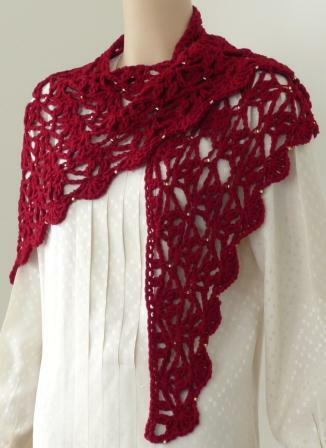 To make the armholes, there are very simple and totally optional attachments at the underarms, made while crocheting the final row of trim. Although each of the three versions is only one size, each garment can accommodate a range of bodies in different ways, so most everyone can have a Curacao Jacket that fits and flatters. 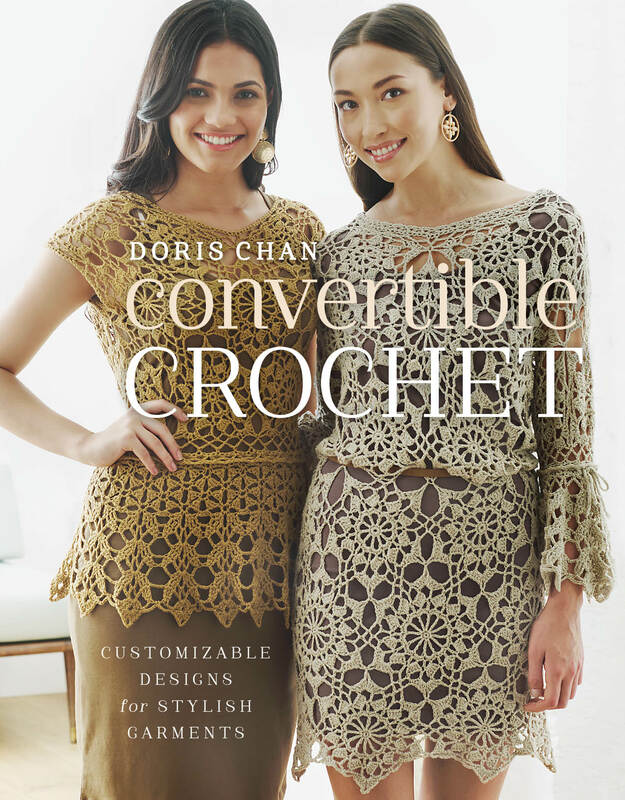 Updated with a few design tweaks, revised instructions, detailed photography and fresh diagrams, this pattern set also includes instructions for making the original shawl bigger and longer, something not offered in the book design but often requested by readers. Requiring from two to five balls of Lotus, and otherwise perfectly doable with any yarn or combination of yarns that gives you the fabric and dimensions you desire, DJC: Lotus Curacao Jacket just might be the pretty little layer you should crochet for yourself this season. 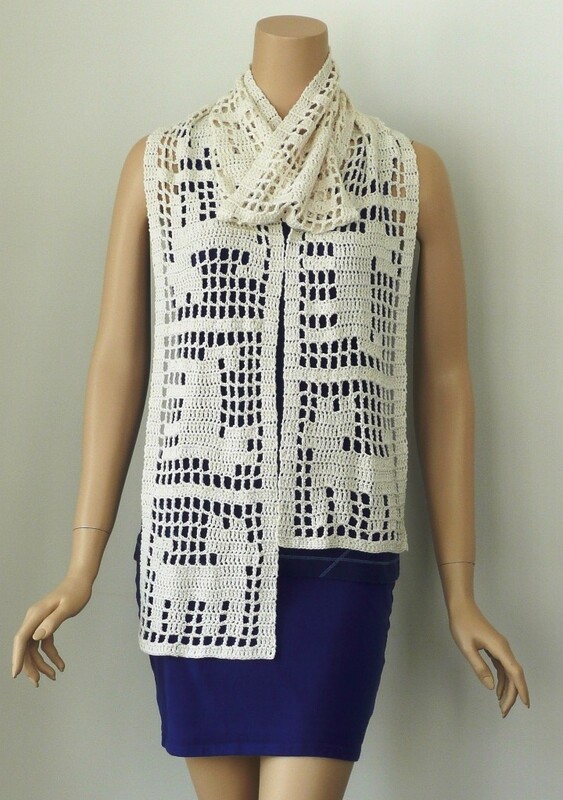 Please visit DesigningVashti.com for the latest products. Vashti has a staggering array of Tulip brand crochet hooks, including Etimo cushion grip hooks in sets and individually, plus Chiaogoo bamboo Tunisian hooks, straight and circular, in hard-to-find sizes and lengths. Oh, and that strange Jelly Yarn, too. 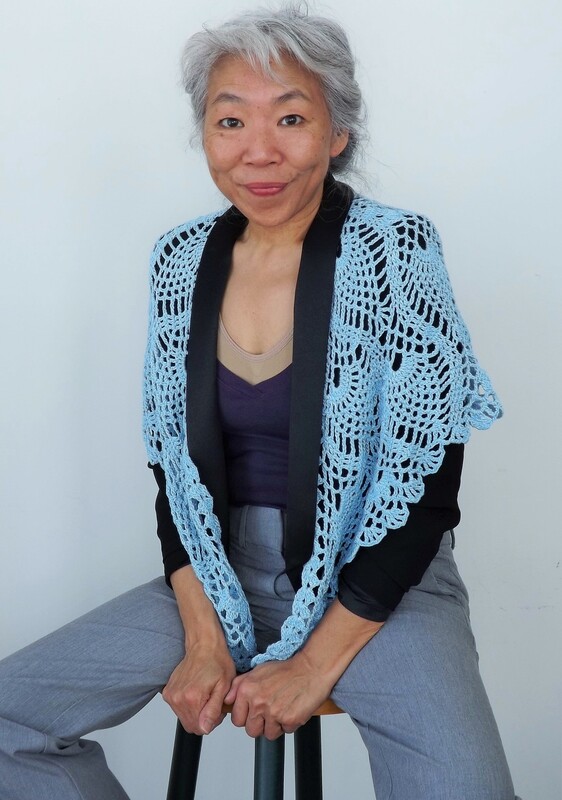 May I tempt you with these three projects created for DesigningVashti Lotus yarn, gathered into one collection, DJC: Lotus Wings. One can’t quite call these little beauties shawls; each using just two balls of Lotus, they’re not designed for full coverage. Besides, in this stunning, drapey, luminous fiber they will not keep you warm as you might want from a full-sized shawl. — Make you feel special (in the most wonderful way). Oh, there is another brilliant thing about Lotus Wings. They make exceptional gifts if you can bear to part with them.